The Greater Riverview Chamber of Commerce (GRCC) hosted their annual Golf Tournament with a theme of Play 18 in 2018. The event took place on Saturday, March 3, 2018 at Summerfield Crossings Golf Club. The day was the epitome of Chamber of Commerce Weather. It provided the perfect backdrop for players and non-players alike to visit the vendors set up along the perimeter of the Putting Contest. Among the vendor spots, Marco's Pizza - Symmes & 301, Nothing Bundt Cakes, Chai Yo Thai Cuisine, LLC and Zaxby’s were on site providing tasty treats for everyone to enjoy prior to the tournament. Before to the shotgun start there were many opportunities for the guests to try their luck at winning some fantastic prizes. The Raffle Room contained dozens of terrific baskets and other items donated by the generous members and friends of GRCC. New to this year’s festivities was the Dunk Tank. Committee member Jennifer King, Rodan + Fields, and Hillsborough County Court Judge candidate Michael Isaak goaded contestants into taking a shot at giving them a good soaking. The two volunteers were great sports and the crowd definitely got into the spirit of the dunk. A big hit that was introduced in 2017 made another appearance this year – The Wagon of Cheer. GRCC Ambassadors and Board Members contributed top shelf liquors to create this bar stocking paradise that raised over $1,400 for The Chamber. Of course, the annual Ball Drop, once again sponsored by Bryan Hindman Electric, LLC, was the most anticipated moment of the day. Over $2,400 worth of ball drop numbers were sold this year and the winner was present at the time of the drop which means they walked away with 60% of the pot. Sal DiFonso and Larry Westcott, members of the American Legion team were the very happy winners. Immediately after the culmination of the Ball Drop, Marine Corps League, Sgt. Walter P. Ryan Detachment presented our National Anthem and an official 21 Gun Salute to signal the beginning of the tournament. The 24 eager teams departed the clubhouse for a spirited time on the course. There were those who were serious about winning the tournament and others who just wanted to have fun with their friends. Many holes had individual competitions and Hole #1 had Fuzzy’s Taco Shop on hand to treat everyone to margaritas. During the dinner hour a live auction was conducted that included a high-end toilet with installation, donated by Olin Plumbing Inc., a Wine Tasting from BobbiAnn DePierro of PRP Wine International, Inc., a year’s worth of Chick-fil-A from Tammy Holmberg, Chick-fil-A Brandon and a Corporate Event Package donated by CQ Tactical Laser Tag. 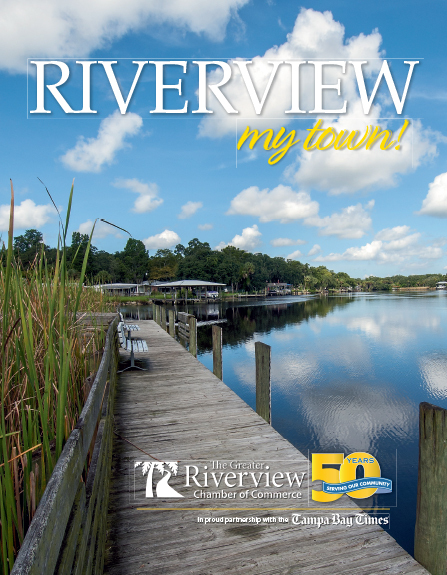 Check out www.RiverviewChamber.com for all the photos and the many other fun events listed on the Community Calendar.